Sony isn't just a brand to beat in the mobile phone industry, but its is also a huge force in the tech industry as a whole, be it cameras, televisions, i-pods, sound systems and other electronics. One segment of electronics where Sony completely stands out is Televisions. Sony televisions are always unique in design (sleek and extremely slim). Sony televisions provide high quality images and user interface. Sony's latest innovation is the 'Sony slate'. Just as the name implies, the television is very flat, just like a slate. This device is so magnificently designed that even the stand and speakers are not visible. 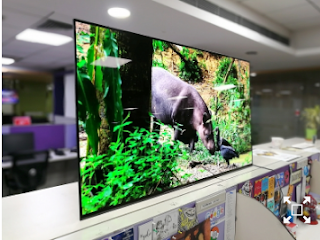 In India, the Sony slate is priced at Rs 3,64,900 for the 55-inch and Rs 4,64,900 for the 65-inch in India, which is quite a princely sum for an average consumer. According to reviews by gadgets now, the television seems good enough for the price tag. Remember the Sony Bravia? This TV looks similar to that device, just that its more sleek in design than the latter. Though, one distinct feature in the Sony slate is its powerful audio mechanism, this makes it seem the sound is coming directly from the screen when watching a video. The Sony slate has a very high rating in terms of display, the device comes in two variants based on 55-inch and 65-inch screen size. The unit we reviewed was the 55-inch model. The TV set has an OLED panel that stuffs 3840x2160 pixel resolution inside. It also supports High Dynamic Range content and it's own powerful processing chip, the 4K HDR processor X1 Xtreme. It also makes use of 4K X-Reality PRODual database processing for enhanced clarity. The colour reproduction and the video frame rate is taken care by the Live Colour Technology/Triluminos display tech and the Motionflow XR. Also, some picture mode in the Sony slate are; Vivid, Standard, Custom, Cinema Pro, Cinema Home. The colours in HDR mode were impressive as they popped out with wider colour range and saturation. The green, blue and red were shown accurately and we had no complaints from the display of the Sony A1. In addition to the quality sound feature, the Sony A1 slate delivers an enhanced sound+picture quality along with all the 'smart' features that come inside an Android smart TV. In the TV menu, you will the images (albums), videos and access to Android apps from the Google Play Store. Also, you can access Netflix with just a click from your remote controller. Some additional services also that come as a part of the Sony A1 interface are Serial AbTak, Opera browser, TV camera (requires and additional camera), Screen Mirroring and more. The Sony slate also has a subwoofer that gives the desired bass, the couple of actuators behind the TV vibrate the screen to create sound. The processor X1 Xtreme handles the heavy 4K or 4K HDR videos without any lags. In conclusion, this device is a good buy considering the price, while in terms of rivalry, I think Samsung and LG are the only brands that can rear their heads.